St Andrews Film Society shows an interesting variety of films monthly at the St Andrews Hall. It is an enjoyable, friendly community gathering. There are over 100 members. There are two groups- Friday Night Group, and Thursday Day Group. ​Click on a group to see more detail. The society is an incorporated body run by a volunteer committee of four office holders and five general members. We are a member of the Federation of Victorian Film Societies and Australian Council Of Film Societies. Both groups are represented. All positions fall vacant at the AGM which is held after 1st July each year. Committee Meetings are held quarterly. The St Andrews Film Society would like to thank the following organizations for their generous support which has been crucial to the success of the group. We would like to thank every individual who has joined the society. Your support is greatly appreciated. SAFS cannot exist with out you! Thank you! The installation of the Audio Visual equipment in the St Andrews hall was inspired by a young couple who had connections to the town. After the Black Saturday fires they organized four free film sessions to help people forget their worries for a little while. There was a session for children followed by one for over 18s. They brought up a portable projector, screen and sound system over four weekends. A clipboard was displayed on the stage inviting the audience to jot down their names if they supported the idea of having films in the hall on an ongoing basis. 70 people put down their names. It was thanks to this support that Bushfire Recovery funds were granted to install a permanent state of the art audio/visual system in the hall for all to use. Creating a Film Society to make good use of the system was the next step. 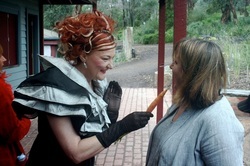 The community were invited to the A/V Grand Launch with a red carpet Oscars style welcome from Miss Wattle on the October 30th 2011. Guests were invited to join the new film society on the spot, and over 80 eagre people signed up- chaos! Nillumbik Council had supported an application for a $3000 New Start Grant to help cover costs for the first year, so membership was a low $10. At the first film night on 18th Nov. another 40 or so members joined. All that was left to do was to invite members to join the inaugural committee. The first year was a challenge. We had to apply for a liquor license. For a permanent license we had to become Incorporated. There were so many things to do! But, now it’s all running smoothly, and each month the members turn up with their membership cards in one hand a plate of food in the other, and a cushion under their arm for another great night at the movies.